Bionematicides Market size was valued at over USD 143 million in 2015 and is forecast to experience gains exceeding 4% CAGR up to 2024. Rapid industrialization, resulting in reduced fertile agricultural land, was a key factor propelling bionematicides market growth in the past decade. In addition, high infestation by nematodes in crops and their increasing resistance to traditional methods will further drive industry growth. Stringent environmental regulations against chemical nematicides and yield losses likely to boost bionematicides demand and help counter the supply-demand gap in coming years. For instance, Uttar Pradesh, India faced tomato yield loss of approximately 30% and over 25% yield loss for potatoes. Global population is projected to surpass 9 billion by 2050. Growing population will consequently drive food demand. This will boost effective land use with high yielding bio fertilizers, crop and seed management to meet increasing demand. Bionematicides owing to its capability to enhance crop yield along with being environmental friendly finds widespread application in farming. Furthermore, trade in agricultural commodities is will expand noticeably. For instance, net cereal imports into the developing countries including Sub Saharan Africa and Latin America, would rise by over three times to reach nearly 300 million tons by 2050. A vibrant agricultural sector has been the basis for a successful economic transformation in USA and European countries, which is now recently emerging in China, Taiwan, Vietnam, Republic of Korea, Thailand and other Asian economies. Higher agricultural productivity demand accompanied with increasing farming should propel bionematicides market share by 2024. Limited variety of bionematicides for various crop may hamper industry growth over the forecast timeframe. However, ongoing R&D on biological nematodes control has introduced antagonistic activity of nematophagous fungi and strains of bacteria against different life-cycle stages of nematode. Paecilomyces lilacinus, Pochonia chlamydospora, and Arkansas Fungus have been recognized as parasites of the egg stage of nematodes. As a result, there are two biocontrol agents available for nematode control on cotton, which are Gossypium hirsutum and Linnaeus. In addition, increasing bio and organic fertilizers acceptance globally will propel bionematicides market share by 2014. Furthermore, increasing customer food demand from bio based and organic fertilizers will complement industry growth. Bionematicides used in cotton was valued at over USD 800,000 in 2015. Nematodes are known to cause approximately USD 80 billion in crop damages globally. Increasing product application in corn farms to protect crops from root knot, sting, cyst and lance nematodes will drive industry growth over the forecast timeframe. In addition, rising farmers approach towards sustainable farming will further complement growth. Corn is projected to experience highest growth more than 4.5% from 2016 to 2024. Increasing demand to enhance crop yield with disease control from biological methods will boost bionematicides market size for corn. Cotton and corn crops require higher soil application to improve yields. Introducing crop friendly bacteria along with organic fertilizers increase yields over 15% to 20% and soil fertility for prolonged duration. 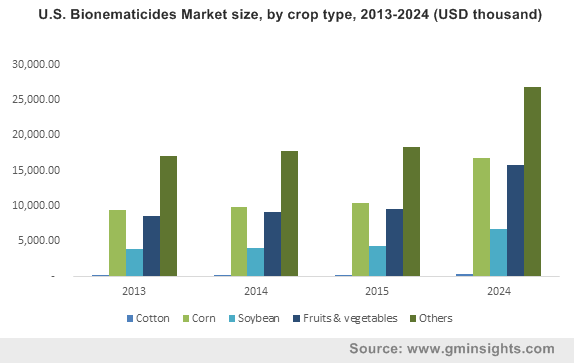 The U.S. bionematicides market was valued at over USD 42 million in 2015 and is primarily driven by increasing biopesticide acceptance over chemical pesticides. For example, the Department of Environmental Toxicology (U.S.) lays emphasis on biopesticides as a viable solution to crop protection and this is likely to help boost bionematicide sales in the region. Furthermore, increasing popularity of agriculture biotechnology such as application of microbe-based pest control and yield enhancers, particularly in the U.S will drive growth. Also, corn and fruits & vegetables are major crop for the regional industry growth. The U.S has major corn processing companies owing to boost growth. Asia Pacific will witness highest gains and grow favorably with a growth rate of over 4% within the forecast timeframe. Rapid industrialization, overpopulation, demographic shifts, affordability, sustainability, climate change, and environmental concerns are major factors affecting the market and believed to drive sales in the bionematicides market. Farming is one of the predominant contributor of Asian countries including China, India and Japan. It is also supported by the government organization in the form subsidies and loan for promoting sustainable farming owing to propel bionematicides market share by 2024. Bionematicide industry participants are also actively involved in developing sustainable technology for agriculture. For instance, BASF SE is engaged in activities such as crop protection and soil management to enhance yields for crops including cereals, corn, oilseeds and rice. Dow AgroSciences is focusing on contributing sustainable food supply chain to bring nutritious and healthy food to people across the globe. In addition, Bayer CropScience is entering into strategic acquisitions to strengthen their bio pesticide product portfolio. By the end of 2015, they had acquired AgraQuest, Prophyta, and Biagro Group. Bionematicides are bio pesticides which are used to control and treat nematode infestation in crops. They consist of the microorganisms including bacteria or fungus. Inert material comprises. Also, bio fertilizers are low cost and are derived from renewable sources such as animal or plant extracts. Bionematicides market is primarily driven rapid industrialization resulting in declining fertile land availability for agriculture. The agricultural sector is highly influenced by leading industry participants focusing on biological or organic methods (bio fertilizers) to enhance crop yield over chemical fertilizers. Furthermore, excessive chemical fertilizers use contaminates soil leading to soil pollution. Increasing microorganism’s use to produce organic nutrient to enrich soil fertility will drive bionematicides market size over the forecast timeframe.